I’m well known for my love of all things violet. You may remember a few weeks ago I was waiting on a delivery of some much coveted violet syrup. Well, the syrup arrived and smells divine so I have set out experimenting with recipes. 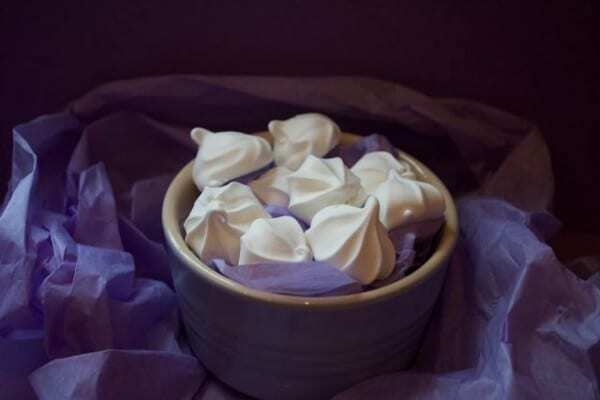 I’m big into making homemade gifts and saw several pics of meringue kisses in lovely gift bags and sellophane. I’ve never even tried to colour meringue before never mind flavouring it but will give anything a go. Fair to say, my first attempt was a complete disaster. Underterred, but a little short on time, I decided to have another go and actually follow the rules of meringue this time – and they worked!! I only gave the meringue kisses a mild taste of violet as I wasn’t sure how much of the syrup, the beaten egg white could tolerate. I reckon if I did it again, I could get away with slightly more violet syrup. Really really take your time adding the sugar - the slower, the better, it should take about 8-10 mins. It is highly unlikely that the meringue can be over whisked - I thought it could. Don't skip the sifting of the icing sugar - any lumps will knock the air out of the meringue. Again, I learnt the hard way that this bit is important. Other flavours that can be used are vanilla extract, peppermint extract, orange extract, cocoa. Whisk the egg whites for around 10 mins on a medium speed building up to a high speed until the whites are at peaks that hold themselves up. Add the salt and the caster sugar REALLY SLOWLY - this is what I did wrong the first time. 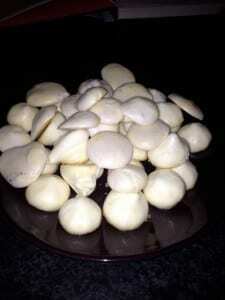 Meringues cannot be rushed. You should after 8-10 mins get firm peaks where the mixture is really quite still - This is the bit where people put the bowl over their heads. Add the Cream of Tartar, the syrup and any food colour at this point - really slowly mixing again. Put the mixture into the piping bags and pipe teeny rosettes onto a baking tray with reusable liner or baking parchment on it. I ended up using 3 baking trays. Bake for 2 hours and leave in the oven until it has completely cooled. Try to resist eating them and bag them up with decorative ribbon for gifts. Can be kept in air-tight tupperware for 3 months. I use disposable icing bags as they are easier to handle than baking paper bags. I use the star nozzle and leave quite a peak when I pipe them. Just to prove that disasters happen but perseverance pays off, here’s a pic of the first attempt at meringue kisses – hmmm look delicious? 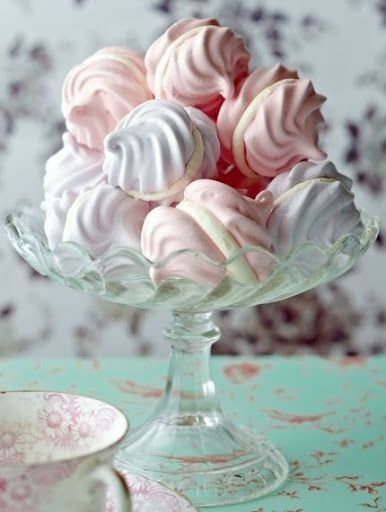 MMmmm I love meringue (I’ve even been to Meiringen in Switzerland where they were invented as a sort of pilgrimage!) Not too keen on violet, but I have got some lovely lemon essence which I’m sure would be lovely. Mmm lemon sounds lovely – as does a trip to Meiringen! I am in Paris and just purchased an enormous violet meringue and tasted it. Aside from tasting like a LUSH product and being relatively inedible in its current state – I am wondering, like lavender with lemon, if there is something that ‘goes’ with it. It is violently purple and violently flavored. Any help would be welcome. Many thanks! Oh what a shame – too strong a violet taste would be rather perfumy! I quite like the sharpness of a citrus taste rather than a creamy taste with violet. Something like hazelnuts might add that extra something though? Good Luck!